Transparency Market Research (TMR) has published a new report titled, “Vascular Grafts Market - Global Industry Analysis, Size, Share, Growth, Trends, and Forecast, 2018–2026”. According to the report, the global vascular grafts market was valued at US$ 2,010 Mn in 2017 and is projected to expand at a CAGR of 5.0% from 2018 to 2026. Increase in incidence of cardiovascular diseases and peripheral diseases is anticipated to boost the growth of the global market from 2018 to 2026. However, demand for vascular grafts is expected to decline during the forecast period owing to its adverse effects and stringent regulatory guidelines for new product approval. 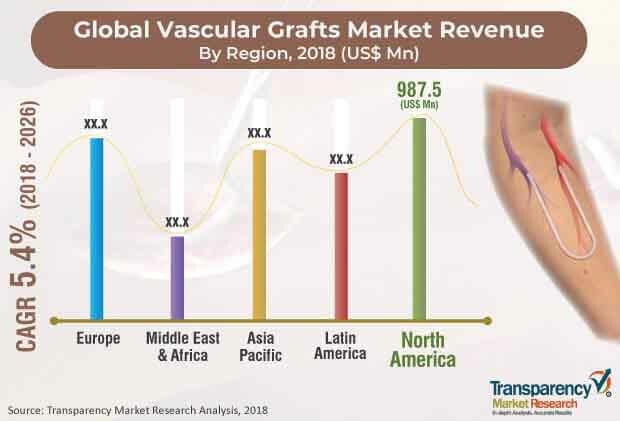 However, surge in government investment in health care infrastructure and strategic alliances among players to penetrate the emerging markets are likely to propel the global vascular grafts market during the forecast period. For instance, in April 2018, Terumo Corporation’s Vascutek merged with Bolton Medical to form a single entity focused on the aortic and vascular implants market. The endovascular stent grafts segment accounted for the largest market share in 2017. The segment is anticipated to expand at a high CAGR during the forecast period, owing to increase in the number of coronary artery and CKD patients and vascular surgeons preferring graft- and stent- based surgeries. Moreover, endovascular stent graft therapy is a minimally surgical procedure and reduces the recovery time by several days. In term of size of vascular graft, the large segment is projected to account for the largest market share during the forecast period owing to the wide usage of larger grafts of diameter above 6mm in the treatment of vascular diseases due to its high patency and flexibility. The hospitals segment held the largest share of the global vascular grafts market in 2017. Rise in awareness about advantages of hospitals such as availability of advanced devices, all levels of treatment for different surgeries, and trained staff boosts the growth of the segment. Additionally, favorable reimbursement facilities provided by hospitals through different Medicare policies also increases patient preference for surgery in hospitals. North America Market to be driven by Rise in Vascular Surgeries, especially in U.S.
North America held major share of the global vascular grafts market in 2017, supported by high cost of technologically advanced grafts and rise in prevalence of cardiovascular diseases. Moreover, increase in R&D activities for the development of small size vascular grafts to treat small vascular diseases augment the market in the region. According to the American Heart Association (2013), around 400,000 coronary artery bypass grafting (CABG) procedures are performed each year in the U.S. alone. Key companies operating in the global vascular grafts market and profiled in the report include W. L. Gore & Associates, Inc., Maquet Holding B.V. & Co. KG (Getinge Group), BD, LeMaitre Vascular, Inc., B. Braun Melsungen AG, Cook Medical, Medtronic plc, Artegraft, Inc., Vascutek Ltd., Vascular Graft Solution Ltd., Heat Medical Europe BV, and CryoLife, Inc. Market players adopt strategies such as expansion of product portfolio by developing new products or through acquisitions and licensing agreements. For instance, in February 2016, Vascular Graft Solutions Ltd. received unconditional IDE approval from the U.S. FDA to initiate a study to support the future premarketing approval (PMA) application for the VEST external support for coronary bypass vein grafts.